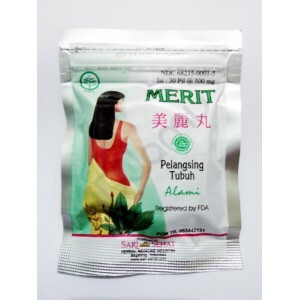 Jamu Merit reduces flabbiness, while protecting the tone of your skin after weight loss. Jamu Merit is a traditional oral preparation used to induce weight loss and support a healthier, trimmer figure. It has no side effects for long term consumption. This slimming jamu is made from natural herbs and contains no artificial chemical substances. Take 3 pills once a day before sleeping at night. If necessary, take 3 pills more in the morning. For beginning treatment, just take 2 pills once a day before sleeping.